Performed at the Tzadik Poznan Jazz Festival in Poland, 2011, this band is pretty unique, with grandmaster Perry Robinson on clarinet and ocarina, Waclaw Zimpel on clarinet and bass clarinet, Raphael Roginski on guitar, and Michael Zerang on drums, frame drum and darabuka. Apparently the Yemenite music is revived from archives dating back thousands of years ago. And the music is absolutely haunting and mesmerising, with Zerang and Roginski offering a repetitive trance-inducing rhythm on each long track, over which both clarinets intertwine in spiralling phrases, or with one leader singing in moaning melancholy, echoed with even sadder phrases by the counterpoint clarinet. And if the rhythmic patterns make your blood pump through your veins in synchronised empathy, contracting your muscles to force your entire body to move along, the beautiful clarinets wave by as free as the desert wind, as a breeze over warm sand and stories past. The music is maybe of jewish origin, yet it doesn't sound like klezmer, and Yemen is close enough to Africa to have benefited from the continent's rhythms. We all know the skills and talent of Robinson, Zimpel and Zerang in the meantime, they have been featured many times on this blog, yet guitarist Raphael Roginski is at the same high level, also featured on other recent albums such as Shofar's "Ha-Huncvot" and Sisters' "The Mono". 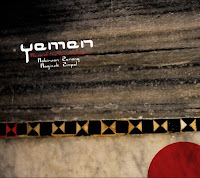 His clean tone, his rhythmic approach and his stylistic immersion in the music, make it sound as if the electric guitar has been part of the Yemenite instruments of choice since the early days. A real achievement of control and expressive skill. An astonishing and beautiful performance and adepts of Middle-Eastern music in modern form shouldn't miss this one. Deep Listening Weekend: Just Not Cricket!